In 1916, the 6-year-old Boy Scouts of America faced increasing competition from other organizations — groups that wished to capitalize on the growing interest in all things Scouting generated by the BSA. Something had to be done to protect the BSA “from those who are seeking to profit by the good repute and high standing and popularity of the Scout movement by imitating it in name alone,” Scouting magazine wrote. So Congress and President Woodrow Wilson stepped in. On June 15, 1916, Wilson signed a bill into law that granted federal incorporation to the Boy Scouts of America and protected the BSA’s name and insignia. The purpose of the corporation shall be to promote, through organization, and cooperation with other agencies, the ability of boys to do things for themselves and others, to train them in Scoutcraft, and to teach them patriotism, courage, self-reliance, and kindred virtues, using the methods which are now in common use by Boy Scouts. How has Scouting’s purpose changed in the 100 years since? I’d say that though some of our delivery methods have been refreshed — new merit badges, new high-adventure opportunities, programs for young women, and more — our purpose is the same. Scouting helps young people learn to do things for themselves. And that’s pretty awesome. It also meant the BSA had friends in high places — a trend that continues 100 years later. Section 8 of the BSA’s charter requires the Boy Scouts of America to present its annual report to Congress. That requirement spawned the Report to the Nation, an annual tradition in Scouting that I covered earlier this year. 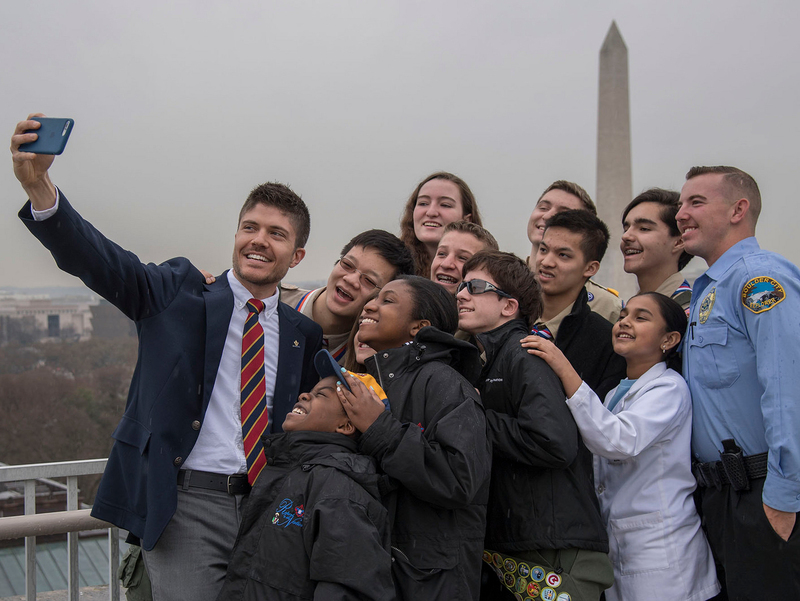 Walking around Washington, D.C., with these youth representatives confirmed that powerful people in our nation’s capital still believe in the power of Scouting. In addition to serving as the BSA’s honorary president and signing our charter, President Woodrow Wilson was a strong supporter of Scouting. The American people need the BSA, and the BSA needs the American people. “Anything that is done to increase the effectiveness of the Boy Scouts of America will be a genuine contribution to the welfare of the nation,” Wilson said. The 100th anniversary of our congressional charter is cause for celebration. In the Dan Beard Council in Cincinnati, a Second Century Society event at the Taft Museum of Art will include remarks from Bob Taft, former governor of Ohio and great-grandson of the first honorary president of the BSA, William Howard Taft. Is your pack, troop, team, post, ship or crew — or your local council — doing something to celebrate? Let me know in the comments. Be it enacted by the Senate and House of Representatives of the United States of America in Congress assembled, That Colin H. Livingstone and Ernest P. Bicknell, of Washington, District of Columbia; Benjamin L. Dulaney, of Bristol, Tennessee; Milton A. McRae, of Detroit, Michigan; David Starr Jordan, of Berkeley, California; F. L. Seely, of Asheville, North Carolina; A. Stamford White, of Chicago, Illinois; Daniel Carter Beard, of Flushing, New York; George D. Pratt, of Brooklyn, New York; Charles D. Hart, of Philadelphia, Pennsylvania; Franklin C. Hoyt, Jeremaiah W. Jenks, Charles P. Neill, Frank Presbrey, Edgar M. Robinson, Mortimer L. Schiff, and James E. West, of New York, New York; G. Barrett Rich, Junior, of Buffalo, New York; Robert Garrett, of Baltimore, Maryland; John Sherman Hoyt, of Norwalk, Connecticut; Charles C. Jackson, of Boston, Massachusetts; John H. Nicholson, of Pittsburgh, Pennsylvania; William D. Murray, of Plainfield, New Jersey; and George D. Porter, of Philadelphia, Pennsylvania, their associates and successors, are hereby created a body corporate and politic of the District of Columbia, where its domicile shall be. That the name of this corporation shall be “Boy Scouts of America,” and by that name it shall have perpetual succession, with power to sue and be sued in courts of law and equity within the jurisdiction of the United States; to hold such real and personal estate as shall be necessary for corporate purposes, and to receive real and personal property by gift, devise, or bequest; to adopt a seal, and the same to alter and destroy at pleasure; to have offices and conduct its business and affairs within and without the District of Columbia and in the several States and Territories of the United States; to make and adopt bylaws, rules, and regulations not inconsistent with the law of the United States of America, or any State thereof, and generally to do all such acts and things (including the establishment of regulations for the election of associates and successors) as may be necessary to carry into effect the provisions of this Act and promote the purposes of said corporation. That the purpose of this corporation shall be to promote, through organization, and cooperation with other agencies, the ability of boys to do things for themselves and others, to train them in Scoutcraft, and to teach them patriotism, courage, self-reliance, and kindred virtues, using the methods which are now in common use by Boy Scouts. That said corporation may acquire, by way of gift, all the assets of the existing national organization of Boy Scouts, a corporation under the laws of the District of Columbia, and defray and provide for any debts or liabilities to the discharge of which said assets shall be applicable; but said corporation shall have no power to issue certificates of stock or to declare or pay dividends, its object and purposes being solely of a benevolent character and not for pecuniary profit to its members. That the governing body of the said Boy Scouts of America shall consist of an executive board composed of citizens of the United States. The number, qualifications, and terms of office of members of the executive board shall be prescribed by the bylaws. The persons mentioned in the first section of this Act shall constitute the first executive board and shall serve until their successors are elected and have qualified. Vacancies in the executive board shall be filled by a majority vote of the remaining members thereof. The bylaws may prescribe the number of members of the executive board necessary to constitute a quorum of the board, which number may be less than the majority of the whole number of the board. The executive board shall have power to make and to amend the bylaws, and, by two-thirds vote of the whole board at a meeting called for this purpose, may authorize and cause to be executed mortgages and liens upon the property of the corporation. The executive board may, by resolution passed by a majority of the whole board, designate three or more of their number to constitute an executive or governing committee, of which a majority shall constitute a quorum, which committee, to the extent provided in said resolution or in the bylaws of the corporation, shall have and exercise the powers of the executive board in the management of the business affairs of the corporation, and may have power to authorize the seal of the corporation to be affixed to all papers which may require it. The executive board, by the affirmative vote of a majority of the whole board, may appoint any other standing committees, and such standing committees shall have and may exercise such powers as shall be conferred or authorized by the bylaws. With the consent in writing and pursuant to an affirmative vote of a majority of the members of said corporation, the executive board shall have authority to dispose in any manner of the whole property of the corporation. That an annual meeting of the incorporators, their associates and successors, shall be held once in every year after the year of incorporation, at such time and place as shall be prescribed in the bylaws, when the annual reports of the officers and executive board shall be presented and members of the executive board elected for the ensuing year. Special meetings of the corporation may be called upon such notice as may be prescribed in the bylaws. The number of members which shall constitute a quorum at any annual or special meeting shall be prescribed in the bylaws. The members and executive board shall have power to hold their meetings and keep the seal, books, documents, and papers of the corporation within or without the District of Columbia. That said corporation shall have the sole and exclusive right to have and to use, in carrying out its purposes, all emblems and badges, descriptive or designating marks, and words or phrases now or heretofore used by the Boy Scouts of America in carrying out its program, it being distinctly and definitely understood, however, that nothing in this Act shall interfere or conflict with established or vested rights. That Congress shall have the right to repeal, alter, or amend this Act at any time. Photo via Woodrow Wilson Presidential Library and Museum. I couldn’t find an image of Wilson signing the BSA charter, but this shows what that scene might’ve looked like — though Wilson would’ve been surrounded by BSA representatives.